It’s often the little things which put a smile on my face, those unexpected quirks you stumble across on the trail. In truth I needed something to put a smile on my face. Four days of walking in drizzly rain had dampened spirits considerably. I wasn’t feeling the Bavarian love. 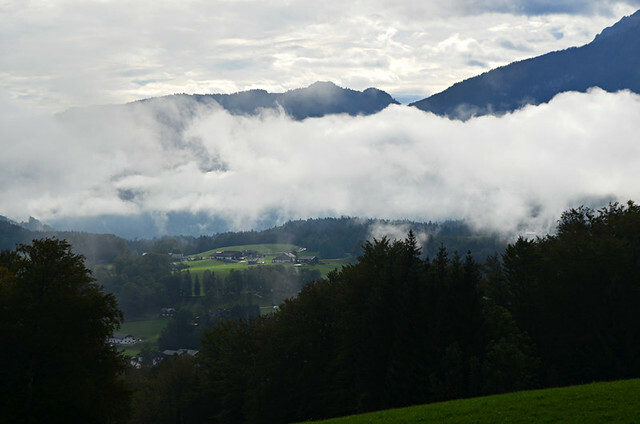 The scenery might have been inspirational but not for me as it had kept its curves concealed under a blanket of cloud. The previous day we’d walked 20km without sitting down once as a) everything was wet and b) the only dry place to shelter, a mountain hütte, was closed because summer was over. I really wasn’t feeling a warm glow toward this allegedly lovely corner of Bavaria. Unfair I know, the weather is the weather and I’m sure if I’d spent my time in a jolly tavern downing dunkel bier I’d have felt different. But our days had been wet ones, trudging through damp forests and along mushy meadows. 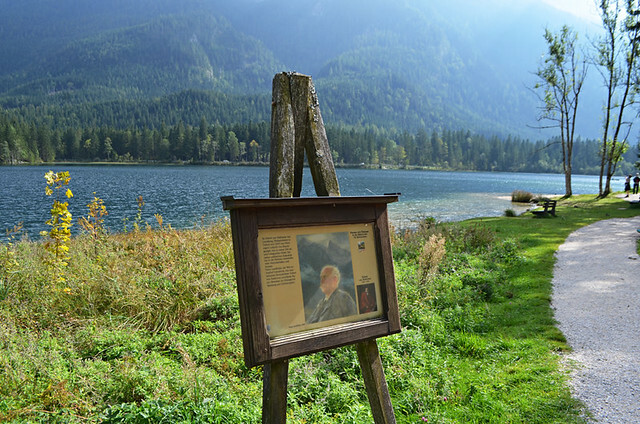 A weather-beaten easel beside Lake Hintersee near Ramsau took a decent chip out of my ambivalence. On the easel was an image of an artist with an explanation (in German so there was quite a bit of guess work involved in the dodgy translation). There was nothing particularly spectacular about it, but it prodded my curiosity and added an attractive little quirk to what was already an engaging scene. The fact the clouds had parted and the sun was starting to finally smile on us helped with a rapid thawing of my mood. A couple of hundred metres and there was another easel with an image of a different artist. Then another, but this time the image matched the panorama laid out before it. 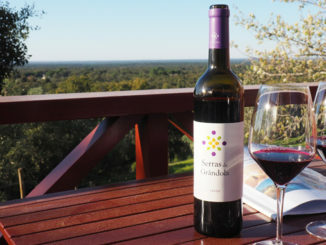 The area held a magnetic appeal for artists, drawn to grand landscapes which awed and inspired. 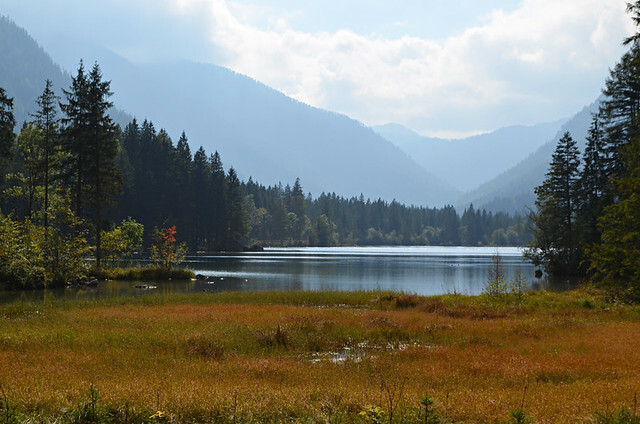 The dissipating clouds acted like curtains being raised on a performance and the sun danced across Hintersee, filling nature’s canvas with vibrant colours. Some clouds remained, hugging the mountain tops. It wouldn’t do to reveal all in one go. Better to save some surprises for another day. And anyway, the moody clouds lounging around the mountains like bored teenagers added attitude to the dreamy lakeside scene. Our path took us past ducks who laughed at their own jokes and plump black water fowl of the sort I can never decide whether they’re coots or moorhen. 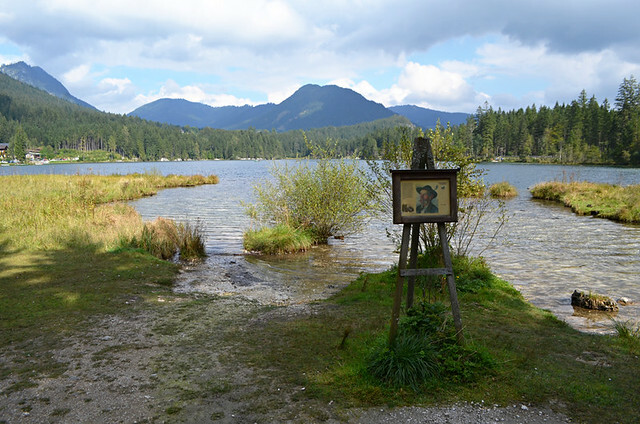 Suddenly there was a wealth of interesting things to mull over; rocks in the lake with proud lone trees on them, mini religious shrines, kitschy woodcutters carved from wood (maybe they made themselves)… a toilet door with ‘pissoir’ on it. 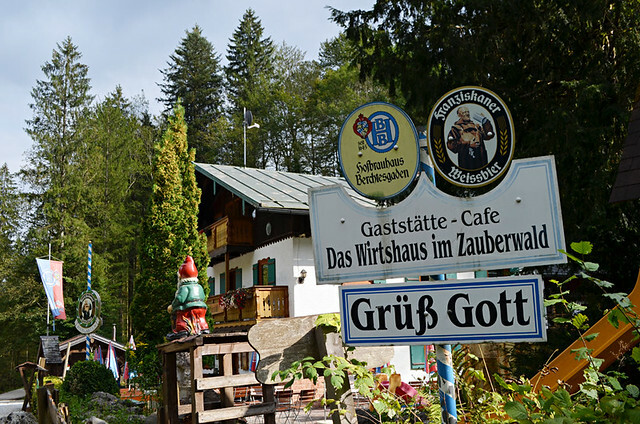 As we reached the northern end of the lake our path veered into thick woods, the Zauberwald – a magic forest with a gurgling gorge (usually popular haunts for ogres and river sprites in Germany), a wish throne, more artists’ easels and a gnomes’ biergarten which had an Irish whiskey corner (no doubt making it popular with visiting leprechauns as well). The biergarten was unfortunately shut so we didn’t get to witness any little fellows with big, shiny red noses guzzling ale. 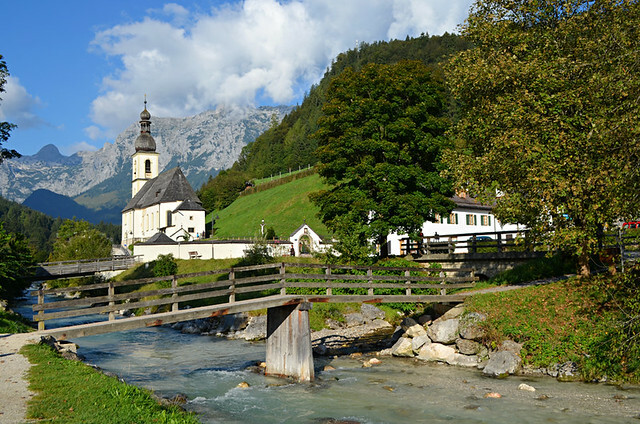 The path followed the flow of the Ramsauer Ache stream back to Ramsau where rural charm was replaced by biscuit box village scenes which included a traditional wooden building with window boxes whose flowers cascaded towards the lively river below, and the Church of San Sebastian, itself a draw for modern day artists who capture its sleek lines on memory sticks rather than canvas. 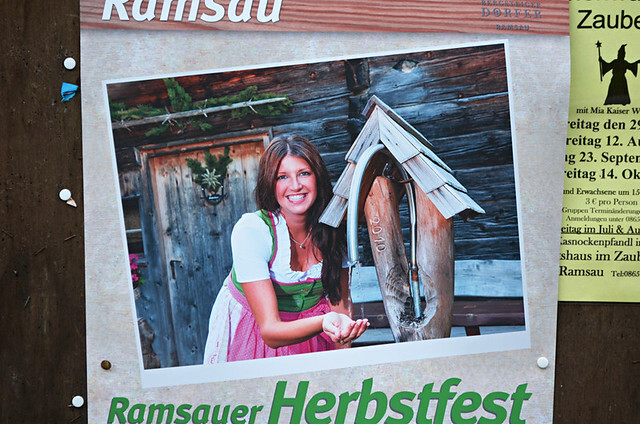 I’d taken a liking to Ramsau when I saw it briefly a few days earlier. 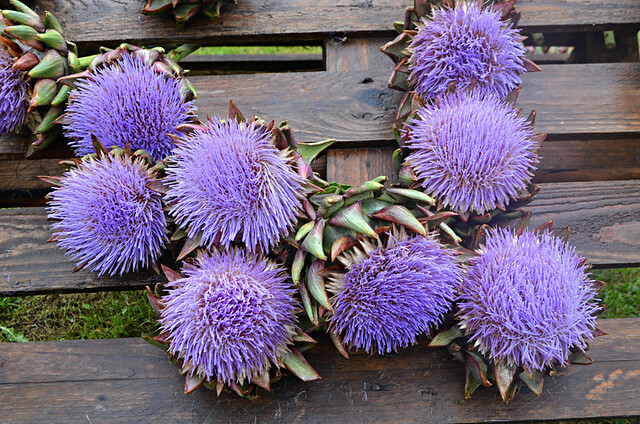 Even though the weather had washed out much of its prettiness, a display of flowering artichokes randomly arranged on a wooden palette had pierced the gloom. 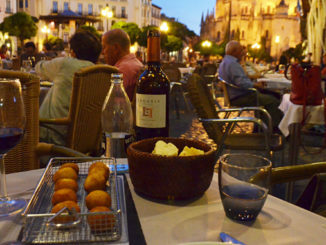 However, the most welcome site was a biergarten in the middle of all the loveliness which was actually open. Before any frothy ale could be supped to celebrate the fact that Berchtesgaden had decided to woo us there was another plaque to read, one dedicated to the 30th Field Squadron Royal Engineers who in 1963 had been based in the town, helping repair bridges and roads. They bonded so well with the residents that a shindig was held at the end of their stay to thank them. The squadron returned various times over the following couple of years and lifelong friendships were cemented. There were even two marriages between soldiers and local girls. It made me think of childhood friends from my home island who’d joined the army, served in Germany and also married German girls. In times when it feels as there are those who are doing their utmost to create divisions, it was especially heart-warming to read about positive connections between ordinary people from different countries. In the great scheme of things it was only a tiny slice of the past where not a lot happened except friendships bloomed and happy memories were created. But like I said, it’s often the little things which turn that frown upside down.